The NZ Blackcurrant Industry | Blackcurrants New Zealand Inc.
Blackcurrants (Ribes nigrum) were first planted commercially in New Zealand in the early 1970s. 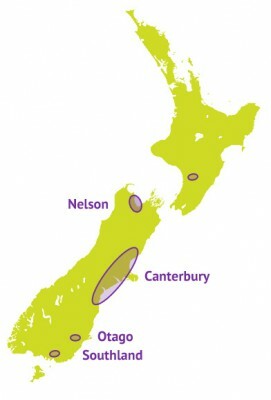 More extensive plantings followed in the late 1970’s and early 1980’s in Nelson, Canterbury and Southland. The number of commercial growers peaked in the mid 1980’s and then shrunk, as the Southland crop was removed due to less than optimal growing conditions and crop yields. Although there are fewer growers the planted area and production yields have continued to grow since the late 1990’s. In the 2016/2017 season there are 27 levy paying grower members of BCNZ, with a total annual production volume ranging between 6,500 – 9 000 tonnes. The bulk of New Zealand Blackcurrants are processed by our member processors into concentrate, which is then exported around the world. To locate suppliers of raw or processed blackcurrants, visit the Links page to find contact details for growers, exporters and processors. 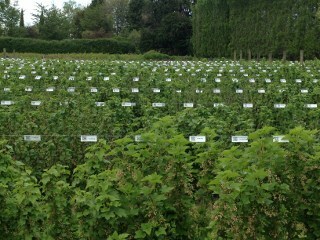 BCNZ and Plant and Food Research are partners in BlackHort, a jointly funded NZ blackcurrant breeding programme, which began in 1992. BlackHort also administers and collects royalties from plant and fruit sales. Successful varieties that have been released to growers from the breeding programme and are now being grown include “Sefton”, “Murchison”, “Blackadder”, “Melina”, “Isobel”, “Kepler”, “Campbell”, “Hopkins” “Stewart”, “Hamilton” and “Christina”. We are very proud of the links that our programme has established with the James Hutton Institute in Scotland, the Research Institute of Horticulture in Poland and the Tasmanian Institute of Agriculture in Australia. CLICK HERE to see Plant and Food Research footage of our breeding plot in Canterbury. Share "The NZ Blackcurrant Industry"